pass openings | high road to.. The official road marker changed within the last hour : finally open, no reservations. Keylong, the district headquarters of Lahaul-Spiti, and other higher hills received about four inches of snowfall, while lower areas received light showers last night. Official sources said Sisu in the district had till now recorded about two feet of snowfall during the last four days. Baralacha Pass and Lady of Keylong and other mountain peaks, Petsio and Kibber village, the highest village of the world situated at an altitude of 16,000 feet, were also experiencing snowfall in the district. The 13,050 feet-high Rohtang Pass and Manali-Leh road continued to remain closed for vehicular traffic after receiving heavy snowfall during the last four days and Border Road Organisation (BRO) officials said the Pass would now only be opened by the first week of May. 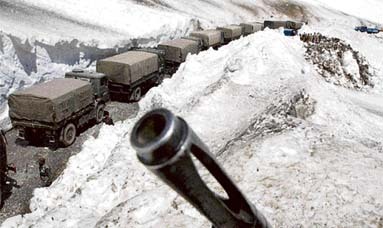 The 435-km-long Srinagar-Leh highway will be open to a trial run of Army convoy on May 20 after which the road, the only surface link to the frontier cold desert region of Ladakh, will be opened for the summer months.